Loudonville, NY. 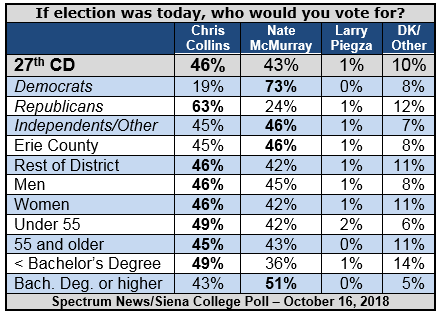 Three weeks from election day, Republican Representative Chris Collins holds a narrow three-point lead over Democrat Nate McMurray, 46-43 percent, according to a new Spectrum News/Siena College poll of likely 27th C.D. voters released today. Collins has a negative 37-49 percent favorability rating, compared to 32-21 percent for McMurray, the Grand Island town supervisor. “The indicted incumbent, who only recently reignited his campaign after initially suspending it, ekes out a small advantage over his challenger,” said Siena College pollster Steven Greenberg. “Republican Collins holds a narrow three-point lead over Democrat McMurray in a district that has more than 40,000 more Republicans than Democrats. A district that favors Republicans maintaining control of the House by 18 points. And a district that gives President Trump an 18-point net positive job approval rating. “While McMurray is supported by nearly three-quarters of Democrats, Collins has the support of 19 percent. However, with the support of nearly one-quarter of Republicans, McMurray does better than Collins with the opposite party. Independents are nearly evenly divided,” Greenberg said. “Men are nearly evenly divided, as women tilt toward Collins by four points. In the biggest demographic divide, voters with less than a bachelor’s degree favor Collins by 13 points, while those with at least a bachelor’s favor McMurray by eight points. “Collins is well known but not particularly well liked. Only Republicans view him favorably, and that’s not overwhelming at 48-35 percent. In fact, one of every eight Collins voter views him unfavorably. At the same time, Republicans approve of Trump 74-17 percent,” Greenberg said. “McMurray is still largely unknown to about half the electorate but has a solid 50-11 percent favorability rating with Democrats. 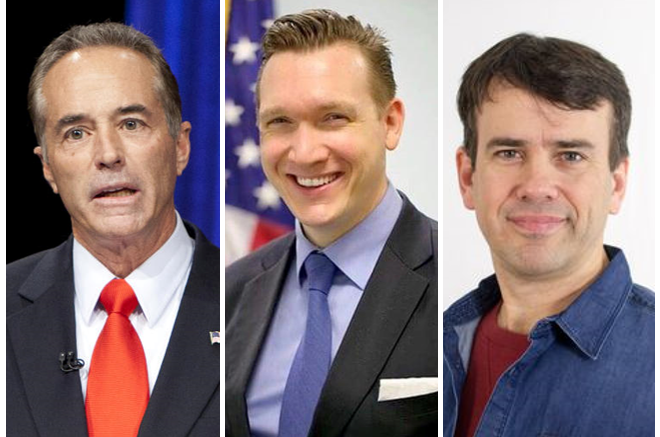 “New York has certainly seen its fair share of indicted officeholders being re-elected, including former Rep. Michael Grimm in NY11 in 2014. It remains to be seen whether this will be another example or not,” Greenberg said. “This is a district where independents lean Republican and the district as a whole strongly leans Republican. Will voters show their loyalty to the President and their party inclinations by re-electing Collins? Or will they spurn the indicted pol and vote for Democrat McMurray despite their yearning for the House to remain in Republican control? “Like many other close races this will come down to turnout. Democrats – who trail Republicans by eight points among registered voters – need to outperform their generally far lower than Republican turnout in midterm election years. Republicans need to rally their troops and get them to continue to significantly outperform Democratic turnout. This is certainly not a headache national and local Republicans had been counting on just a few short months ago,” Greenberg said. This Spectrum News/Siena College 27th C.D. survey was conducted October 6-11, 2018 by telephone calls in English to 490 likely 27th C.D. voters. This poll has a margin of error of +/- 4.7 percentage points. Calls were made to a stratified weighted sample of voters from the L-2 Voter list via both land and cell phones. A likely-to-vote probability was computed for each respondent based on their stated likelihood to vote as well as by virtue of the imputation of a turnout probability score based on past voting behavior. This combined probability to vote score was applied as a weight along with a weight that considered party registration, age, region, and gender. The Siena College Research Institute, directed by Donald Levy, Ph.D., conducts political, economic, social and cultural research primarily in NYS. SCRI, an independent, non-partisan research institute, subscribes to the American Association of Public Opinion Research Code of Professional Ethics and Practices. For more information, please call Steven Greenberg at 518-469-9858. Survey cross-tabulations and frequencies can be found at: www.Siena.edu/SCRI/SNY.